Who would have thought to use a muffin tin tray for more than just muffins? Well someone sure did and they are fantastic ideas. 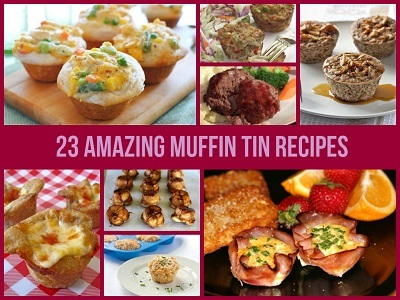 have a look throught this roundup at 23 Amazing Muffin Tin Recipes. This will give you a whole new way to look at what you have lying around your kitchen. There are a few of the items on this list that I have used or done many times now. This is a really useful tutorial that I am sure you are going to love. Add chicken stock and cream of chicken soup to crockpot. Mix in cream cheese, onion flakes, salt, pepper and bacon. Stir together and add hash browns. Cook on high for 5 hours and serve. Top with cheddar cheese and left over bacon crumbles.